The diversity and complexity of what is termed the “Asian region” serves as a major framing device in order to understand the historical and cultural context of the material that follows in the handbook. In this chapter, four “enduring” higher education issues are noted as follows: access and equity, quality and quality assurance, mobility and migration, and regionalism. 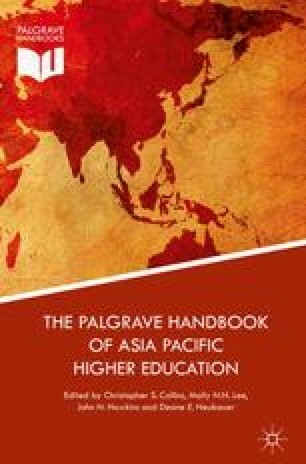 While these are not the only important higher education issues of enduring historical relevance, it is hoped they will stimulate a discussion of the intricacies of higher education in a region as vast and differentiated as Asia. Hawkins, J.N., D.E. Neubauer, and T. DeMott. (eds.) 2011.Quality in higher education: Identifying, developing, and sustaining best practices in the APEC region. APEC Human Resources Development Working Group Report. Available online at: http://publications.apec.org/publication-detail.php?pub_id=1204. Accessed15 July 2015. Mok, K.H. 2011 .Enhancing quality of higher education: Approaches, strategies, and challenges for Hong Kong. In Quality in higher education: identifying, developing, and sustaining best practices in the APEC region. APEC Human Resources Development Working Group Report, eds. J. Hawkins, D.E. Neubauer, and T. Demott. Available online at: http://publications.apec.org/publication-detail.php?pub_id=1204. Accessed15 July 2015. Mori, R. 2011. Evaluating third party evaluator’s role in assuring global equality among premier Japanese universities. In Quality in higher education: Identifying, developing, and sustaining best practices in the APEC region. APEC Human Resources Development Working Group. Report. Available online at: http://publications.apec.org/publication-detail.php?pub_id=1204. Accessed 15 July 2015. Shameel, A. 2003. The new Asian realism: Economics and politics of the Asia Cooperation dialogue. Strategic Studies. Available online at: http://www.issi.org.pk/old-site/ss_Detail.php?dataId=273. Accessed 7 March 2008.